Broadsheet, “The Original Colored Norfolk Jubilee Singers, A Genuine Slave Band” illustrates six singers and a former slave scene. the illustration caption reads, “They Are Genuine Colored People, Emancipated by President Lincoln’s Great Proclamation of Freedom. 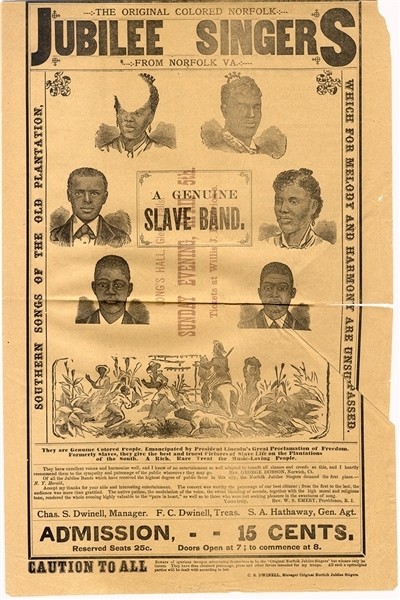 Formerly Slaves, they give the best and Truest Pictures of Slave Life on the Plantation.” The reverse prints the titles of the 90 songs in the programme. Undertrimmed, c1880.